Angie & Joe Reano are a couple from Santo Domingo Pueblo known particularly for their fine, detailed mosaic work. Joe's mother is from the Lovato family and he is related to the Tortalita family by marriage; all notable names in Santo Domingo jewelry. Angie and Joe also taught their sister-in-law Charlene Reano (who married into the clan but is originally from San Felipe Pueblo) to do fine mosaic work. 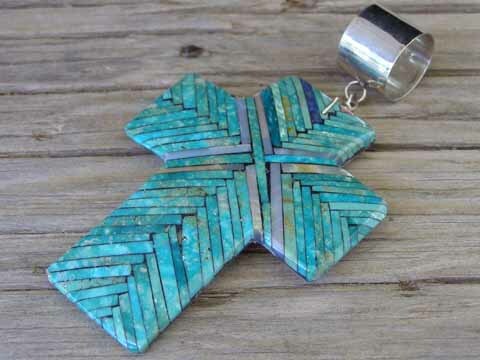 This large cross pendant is a fine example of Angie & Joe's impeccable mosaic work. The small, hand-cut tiles are inlaid on a shell foundation. Traditional jet paste matrix is used as grout between the tiles and the whole shape is polished to a smooth finish. Wear this on Sterling beads or on a turquoise nugget necklace. Dimensions of cross (excluding wire & bale): 2 7/8" x 2 1/8"
THIS ITEM MAY ONLY BE RETURNED FOR CREDIT FOR USE ON THIS WEBSITE.